We asked you to vote for your favourite science online and you didn’t disappoint! We had a record number of voters this year and the results were tight. However we did have a clear TOP 3 FINALISTS in each category — blogs and sites. We will be announcing the blog winners via our social media channels – #CdnSciFav – on Thursday, November 2nd at 12:00 noon EDT / 9:00 am PDT. 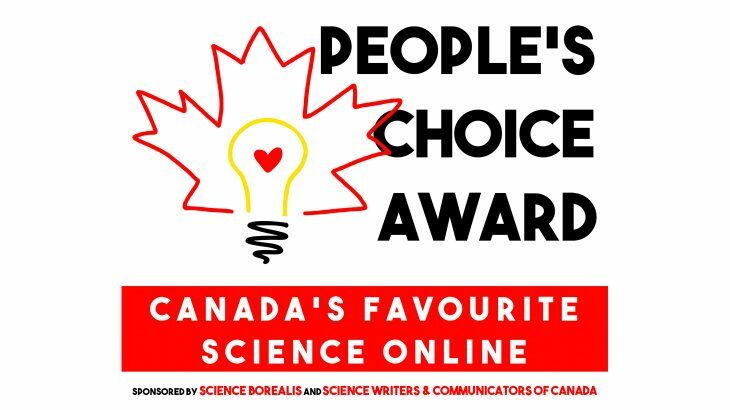 Our collaborator, Science Writers and Communicators of Canada will be announcing the site winners on Monday, October 30th. Meanwhile, check out the Canada’s Top 3 Favourite Science blogs and sites, as voted by YOU! Based in Montreal, the Body of Evidence is a remarkable online resource that explores health science through its blog, podcast, and videos. Hosts Dr. Christopher Labos and Jonathan Jarry have solid, relevant scientific backgrounds, which they apply with a sense of humour in a variety of media. Such clear and insightful science communication seems especially important in health sciences, where pseudoscience is rife and prevailing notions within credible research turn over often. They not only discuss breaking news but also address flawed beliefs about health and science, based on reason and evidence. Every body should check out Body of Evidence. Art the Science is a nonprofit organization that keeps SciArt, and their creators, in focus. Aside from highlighting Canadian work in their Polyfield Gallery and organizing artist residencies in science research laboratories, they maintain a blog that features interviews with accomplished, self-identifying scientists and artists from all over the world. These art-science works redefine the boundaries of each field and illuminate the importance of these interdisciplinary collaborations. The blog’s post gallery engages curiosity and challenges preconceptions with a mosaic of SciArt that prove their innovation and novelty. Art the Science was nominated because it appreciates beauty in scientific form and explores the knowledge behind it. Companion Animal Psychology is run by blogger Zazie Todd from Vancouver. Her goal is to “to explore the ways science can help make our relationship with pets even better.” Every week, Todd publishes a post about our relationship with our pets. Some posts decode new journal articles about how pets behave or how they’ve evolved from earlier ancestors. Other posts provide practical tips on things like reducing stress at the vet, socializing your puppy, or training your pet. She also shares posts about how our pets learn, and their favourite ways of interacting with humans. Todd is heavily involved in pet training, having graduated from Jean Donaldson’s Academy for Dog Trainers. She also serves as a supporting member of the International Association of Animal Behaviour Consultants (Shelter division) and volunteers with the BC SPCA. Not only does Todd share tips and tricks of training, cognition, and exercise on her blog – she’s also been published in Pacific Standard, and was nominated three times in the 2016 Dog Writer’s Association Awards. We are excited that Companion Animal Psychology is one of our top three blogs! Let’s Talk Science’s activities include a national, community-based outreach program that connects educators and youth with volunteers to deliver a wide variety of meaningful science, technology, engineering, and math (STEM) activities for children as young as three years old and youth up to Grade 12. The Nature Conservancy of Canada (NCC) is our leading national land conservation organization, envisioning a Canada that conserves nature in all its diversity, and safeguards the lands and waters that sustain life. NCC also hosts nature days with activities that are both fun and hands-on lessons for young nature lovers. The website has lots of information for nature buffs. Le magazine scientifique québécois depuis 1962. This popular French language magazine recently won a Canadian Magazine Award in the Science, Business, and Politics category. With the latest news, views, and an engaging page for children and youth, Quebec Science delivers science and technology from a fact-based, informed perspective. Announcements and Site News, Special Dates & Events #CdnSciFav, Art the Science Blog, Body of Evidence, Companion Animal Psychology, Finalists, Let's Talk Science, Nature Conservancy of Canada, People's Choice Awards, Quebec Science, scicomm, Top 3. permalink.